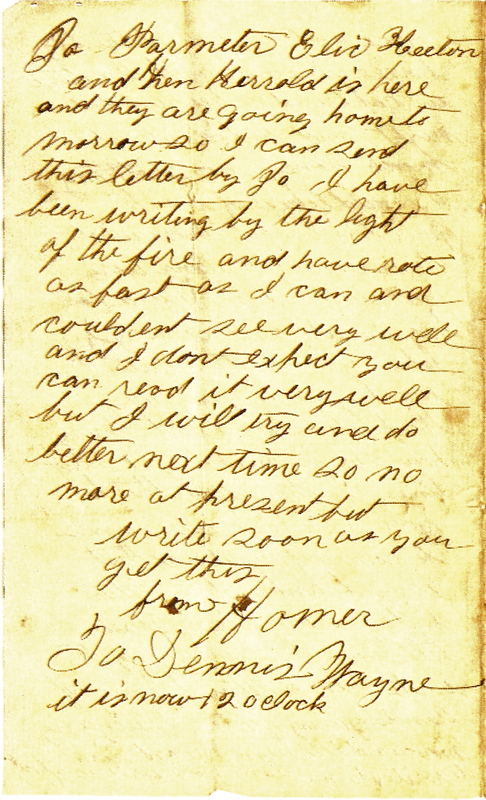 The author of this letter, Homer N. Dowd, enlisted in Company D, 2nd West Virginia Cavalry on 1 September 1861. He remained in the service until December 1864. Homer was born on 11 February 1844 in Vinton, Vinton County, Ohio — the son of John Dowd (1818-1895) and Olive Fuller (1820-1857). 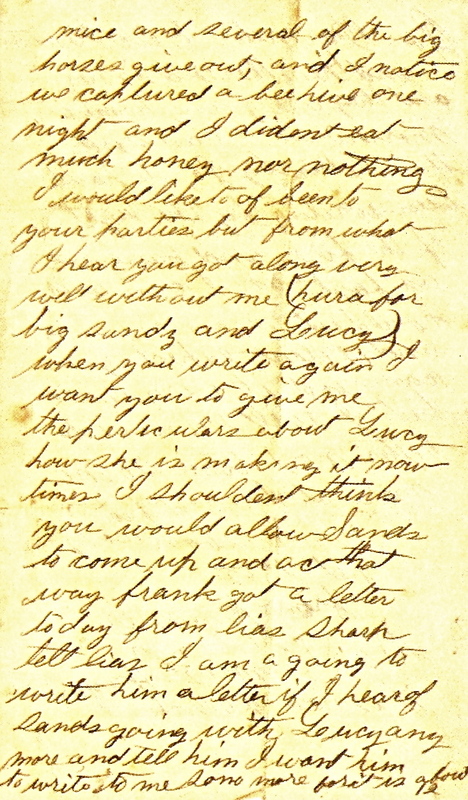 Homer’s grandfather was Conner Dowd (1757-1839), who was also the grandfather of Dennis Wayne Brewer — the recipient of this letter. Dennis W. Brewer was born 12 May 1841 in Vinton County, Ohio. He was a son of John Brewer (1790-1857) and Nancy Dowd (1801-1843). Dennis would himself later enlist in August 1862, joining Company F, 114th Ohio Volunteers along with Homer’s twin brother, Harvey Norton Dowd. Dennis Brewer saw action at Chickasaw Bluff and Arkansas Post in the western theater. 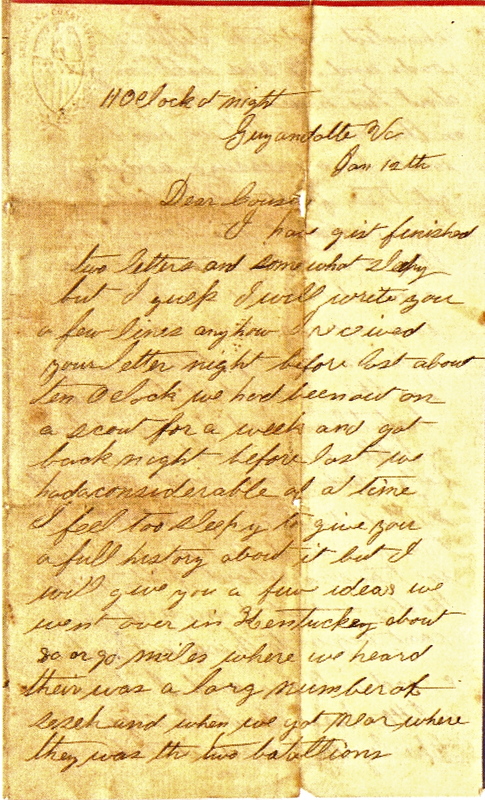 The minor engagement described in this letter occurred near the mouth of Jenny’s Creek not far from Paintsville, Kentucky where the 2nd West Virginia Cavalry surprised confederate cavalry as they were breaking camp. The Federal cavalry initially routed the confederate cavalry, commanded by former Kentucky politician Humphrey Marshall, but were bloodied after being led into an ambush. The entire Union operation was led by future president, James A. Garfield, who then chased the Confederate cavalrymen to Middle Creek, two miles from Prestonsburg, Kentucky, where the Confederates again made a stand and were defeated on January 9, 1862. I have gist finished two letters and somewhat sleepy but I guess I will write you a few lines anyhow. I received your letter night before last about ten o’clock. We had been out on a scout for a week and got back night before last. We had a considerable of a time. I feel too sleepy to give you a full history about it but I will give you a few ideas. 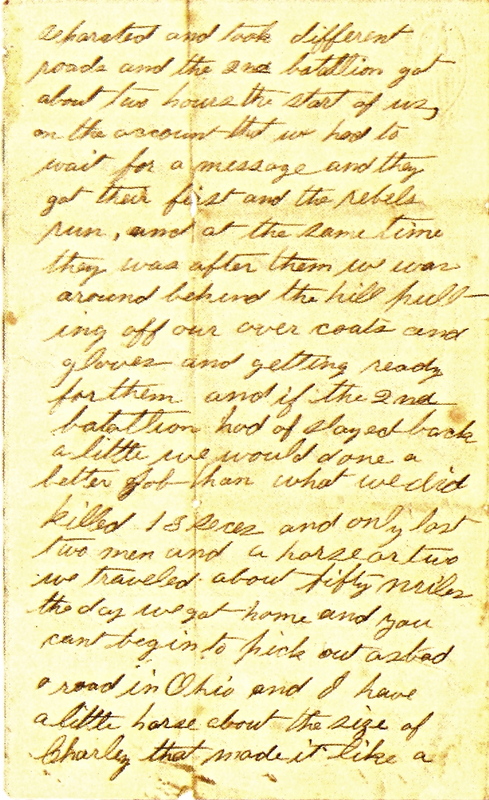 We went over in Kentucky about 80 or 90 miles where we heard their was a larg number of seseh and when we got near where they was the two battalions separated and took different roads and the 2nd battalion got about two hours the start of us, on the account that we had to wait for a message and they got their first and the rebels run, and at the same time they was after them we was around behind the hill pulling off our over coats and gloves and getting ready for them and if the 2nd batallion had of stayed back a little, we would done a better job that what we did. Killed 13 seces[h] and only lost two men and a horse or two. We traveled about fifty miles the day we got home and you can’t begin to pick out as bad a road in Ohio and I have a little horse about the size of Charley that made it like a mice and several of the big horses give out, and I notice we captured a bee hive one night and I didn’t eat much honey nor nothing. I would like to have been to your parties but from what I hear you got along very well without me (hura for big Sands and Lucy). When you write again, I want you to give me the particulars about Lucy, how she is making it now times. I shouldn’t think you would allow Sands to come up and ac that way. Frank got a letter today from [E]lias Sharp. tell Lias I am a going to write him a letter if I hear of Sands going with Lucy any more and tell him I want him to write to me some more for it is about 12. Jo Parmeter, Elic Keeton and Ken Herrold is here and they are going home to morrow so I can send this letter by Jo. I have been writing by the light of the fire and have rote as fast as I can and couldn’t see very well and I don’t expect you can read it very well but I will try and do better next time so no more at present but write soon as you get this. It is now 12 o’clock. For a good article describing the quartering of troops in Guyandotte, West Virginia, click here. This regiment, although mustered into the service as a West Virginia unit, was recruited mainly in Ohio. It was organized August 1, 1861, in Southern Ohio by Colonel William M. Bolles. Ohio’s Governor declined the muster of the Regiment, stating he was under orders to commission no more cavalry. Application was made to Governor F.R. Pierpoint, provisional Governor of the portion of Virginia now known as West Virginia. With the consent of the Secretary of War, Pierpoint accepted the organization and ordered it into camp at Parkersburg. It was mustered as the Second Regiment of Loyal Virginia Cavalry on November 8, 1861. The Regiment operated about Western Virginia until July 1864 when it moved to the Shenandoah Valley. It fought at Kearnstown, Chambersburg, Opequan, Fisher’s Hill, Cedar Creek, Five Forks, Sailor’s Creek, Appomattox Station and was at Appomattox during the surrender of the Confederate Army. The Regiment led the Army of the Potomac in the Grand Review at Washington. It then travelled to Wheeling and was mustered out on the 4th of July 1865. Ordered to Guyandotte, W. Va., December 15, 1861, and duty there till April, 1862. Cooperated with Garfield against Humphrey Marshall January 7-8, 1862.